The story of a defeated supermarket strike in LA, 2003-4. Media coverage was eclipsed by Hollywood's Academy Awards, but on Sunday, Feb. 29, Southern California supermarket workers voted 86% to end their five-month old strike, accepting a contract that amounts to a serious, if not total, victory for a determined employer offensive with national implications.Thus one of the most important strikes in the U.S. in years has ended in defeat. In October of last year, 97% of members of the United Food and Commercial Workers (UFCW) in southern and central California voted to strike Von's, a supermarket chained owned by Safeway, a national chain. The main issue was the health benefits of the workers, paid entirely by the company; Von's wanted the workers to pay 50% of health costs under a new contract. They also wanted to introduce a two-tier wage system. Within hours, two other chains with contracts pending, Albertson's and Ralphs, locked out their employees. Beginning in early October, 70,000 members of the UFCW were on strike in the region. The strike began with great enthusiasm from the workers and with a surprisingly high level of public support, as struck supermarkets remained largely empty, including in the big end-of-the-year holiday season. Further, mass transit workers of Los Angeles struck at the same time, also over health benefits, creating a "strike wave" atmosphere not seen in decades (their strike was handed over to "arbitration" and they returned to work a short time later; at this writing, nothing has been resolved). (Foreign readers should understand that since the U.S. has no national health care system, health benefits are often one of the most important parts of employee compensation. The average wage of a southern California UFCW worker is less than $12 per hour, and most workers are guaranteed only 24 hours of work per week. Many workers hold the job mainly for the health benefits.) The International Longshore and Warehousemen's Union (ILWU) the west coast dockers' union, shut down Los Angeles harbor in a one-day sympathy strike, and shortly thereafter did the same at the nearby San Pedro shipyards. They also contributed $200,000 to the Ralphs strike fund. All three supermarkets are part of national chains as the result of a major consolidation of retail grocery sales over the past 30 years. The supermarkets claimed they needed the givebacks because of impending competition from Wal-mart, the retail giant, which is planning to open 40 new outlets in southern California in the next few years (Wal-mart is infamous for low wages and no employee benefits). Everyone understood that the outcome of the strike would set a pattern for many other unions and workers in the region, and nationally. (Increasing numbers of labor disputes are precisely over health care costs.) Nevertheless, in spite of all the working-class support, the unions have been following the narrow, legalistic strategies that have resulted in so many defeats over the past 25 years. On October 31, they pulled the pickets from Ralphs as a gesture of "good faith" to focus them on Von's; the employers immediately announced that they would be sharing profits and losses during the strike. The union went so far as to urge people to shop at Ralphs, where their own members were locked out. Even though the chains are all national, with total sales of $30 billion a year, the unions shyed away from any national strategy, sending a few "informational pickets" to outlets in northern California and elsewhere. Last fall, the UFCW did manage to win a similar strike at Kroger's (the chain owning Ralphs) in West Virginia, Ohio and Kentucky. On November 24, the UFCW did extend the strike to the ten southern California distribution centers supplying the supermarkets, and the Teamsters (International Brotherhood of Teamsters-IBT) agreed that their 7,000 members delivering to those sites would not cross the picket lines. But the UFCW did nothing to stop thousands of scab trucks delivering the sites, and on Dec. 19 they tried to pull the pickets. On Dec. 22, at the El Monte Von's distribution center, UFCW members refused to close down their picket lines, and they stayed up. By mid- January, picketing resumed at some Ralphs sites, but strike pay had been cut from $240 to $100 per week. In mid-December, John Sweeney and Rich Trumpka, the two top leaders of the "new" AFL-CIO, came to Los Angeles to meet with the presidents of 50 UFCW locals, putting the national prestige of the organized labor movement on the line to win the strike. One might well ask, beyond the usual leftist cries of "betrayal", why they took such a risk after a long string of defeats in previous years. (Union membership under Sweeney, since he took office in 1995, has fallen from 14% to 9% of the U.S. work force.) My own opinion is that, in their own narrow terms, with their timid strategies and tactics, they underestimated the willingness and ability of the three chains to lose millions of dollars in order to break the power of the unions. The unions were successful in keeping the relatively young and inexperienced work force under control. No mass meetings were held to discuss strike strategy, and members generally felt excluded from influence on the direction of the strike. Ralphs was being kept open by scabs from the notorious Personnel Support System, Inc., which provides thuggish "replacement workers" for just these occasions. But the UFCW seemed determined to follow the localist and legalist strategies of so many losing strikes of previous years, not even capable of resorting to the kinds of anti-scab tactics which created unions in the first place. The employers said they were prepared to take a year to defeat the UFCW, and without a change in strike strategy by the workers, they succeeded. 59,000 UFCW members voted on the three-year contract over the weekend of February 28-29. By any standard, the settlement must be considered an important employer victory. While the supermarkets did lose $2.5 billion in income during the strike, they established a precedent for many pending contracts around the country, and not merely for supermarkets. 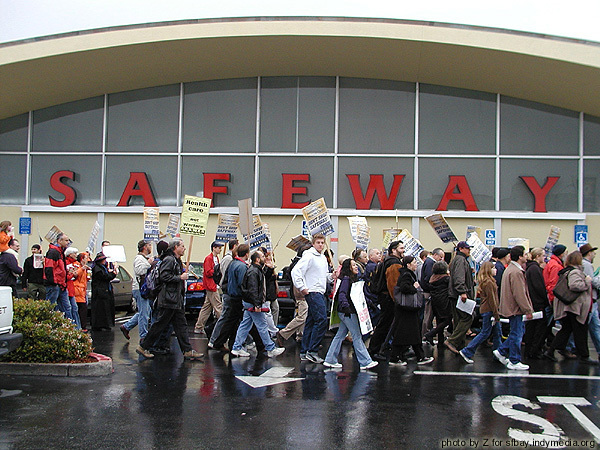 Wall Street greeted the settlement, and Safeway stock prices have remained firm throughout the strike. The new contract provides for a two-tier system. Current employees will receive no pay increase for the first two years of the contract, but will receive a ratification bonus. In the third year, they will begin making monthly payments for the family health plan. New employees will have lower wages and will receive only limited health coverage. The two-tier contract will thus open the way for pushing older employees out the door. Finally, the contract allows the supermarkets to fire up to 630 UFCW members for "misconduct" on the picket lines within 36 hours of ratification. In the same way there were no mass meetings during the strike, the ratification vote was rushed through on a 16-page small print contract. The UFCW and the AFL-CIO declared victory for having saved the health plan for current employees for two years, but no one doubts that for a strike with very strong support from the rank-and-file and from the "public", this was a massive defeat, opening the way for future massive defeats. It is possible that the UFCW leadership in Southern California thought they could win, based on the early momentum, not realizing that the supermarkets had national backing and a national strategy. On Feb. 16, Rick Icaza, president of UFCW Local 770 and a major strike "leader", told the Los Angeles Times that "I felt...we had passed the era of the need for strikes...I thought those days were over." It seems highly probable that at both the local and national levels, the UFCW did not want to embarrass the Democratic Party in an election year. The ultimate issue in this strike was the corporate offensive against the outmoded "private Social Democracy" for the minority of American workers with union-contracted, and no longer affordable, employer health plans. This offensive can only be answered by a class offensive to make universal health care a political issue, one no longer confined to isolated groups of workers in losing local struggles. Don't expect such a struggle from either the UFCW or the AFL-CIO, not to mention the Democratic Party. ... The International Longshore and Warehousemen's Union (ILWU) the west coast dockers' union, shut down Los Angeles harbor in a one-day sympathy strike, and shortly thereafter did the same at the nearby San Pedro shipyards. I guess it's simply a factual error (or a typo, like its gross geographical mistakes: there are 2 harbors behind the breakwater in San Pedro Bay. One is the Port of Los Angles, which is surrounded by the L.A. city districts of San Pedro and Wilmington, and the other is the Port of Long Beach, in the city of the same name and which is divided from the L.A. facilities by the Los Angeles River), but the last shipyard in San Pedro closed in 1989 -- 14 years before the grocery workers' strike was bitterly defeated. But that's how Labor Notes reported it, making the case that they are another disreputable Trotskyist newspaper and should be avoided.